KREATOR: detalles de su nuevo disco "Gods Of Violence"
KREATOR lanzará su 14º álbum, "Gods Of Violence", el 27 de enero de 2017 a través de Nuclear Blast Records. La portada del disco fue creada por el reconocido artista Jan Meininghaus. "Gods Of Violence" fue grabado bajo la atenta mirada del productor Jens Bogren (Opeth, Amon Amarth, Katatonia), quien también mezcló el disco en los famosos estudios "Fascination Street". La masterización se realizó en los mismos estudios por Tony Lindgren. Portada exclusiva para norteamerica obra de Marcelo Vasco. German thrash titans KREATOR have revealed the cover art and release details for their upcoming album, »Gods Of Violence«. The 14th KREATOR album is set to be released on January 27, 2017 worldwide via Nuclear Blast Records. The cover art was created by renowned artist Jan Meininghaus, who also did the limited edition artwork for KREATOR's last album, »Phantom Antichrist« (2012) and lent his talents to band like BOLT THROWER, ACCEPT or OVERKILL in the past. Find the intimidating artwork below.Commented KREATOR mastermind Mille Petrozza: "'Gods Of Violence' was the first song I wrote for this album and it stuck to me as the title track. It contains everything KREATOR is known for and it will blow your minds. Promise!" 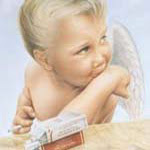 Regarding the artwork Petrozza adds: "The cover of is a perfect reflection of my lyrical vision. I think this is Jan Meininghaus' best work so far." la crem de la crem"
KREATOR nuevo tema "Earth Under The Sword"
El nuevo tema "Earth Under The Sword", puesto en streaming por Decibel Magazine (que lo regala si eres subscriptor), no estará en el próximo álbum de la banda, "Gods Of Violence", que se publicará el 27 de enero de 2017 a través de Nuclear Blast Records. But did you know that Kreator are the latest addition to the ever-expanding Decibel Flexi Series? They’ve contributed a brand new track called "Earth Under the Sword,” which will NOT be included on the band’s stunning new LP, Gods of Violence (out in January on Nuclear Blast). But you don’t have to wait that long to hear another song from that recording session, because we’ve got the flexi tune streaming right here! "Gods Of Violence" el nuevo disco de Kreator, es el número uno en las listas alemanas de venta de discos. KREATOR - »Gods Of Violence« enters German album charts on #1! 2017-02-03 - »Gods Of Violence«, the brand new album by German thrash titans KREATOR has entered the official German album charts on position #1! Commented singer, guitarist and main songwriter Mille Petrozza: "Wow! Number one in Germany, what a great day in the history of KREATOR. Words can not describe how we feel about this, so we just want to say thanks to all the fans, who have made this possible. See you on the »Gods Of Violence« tour!" KREATOR: puestos en las listas de ventas de "Gods Of Violence"
El concierto de Kreator del 16 de diciembre en el Roundhouse de Londres, Inglaterra, será filmado profesionalmente para un futuro lanzamiento, según anuncio la banda en sus redes sociales. London Hordes! 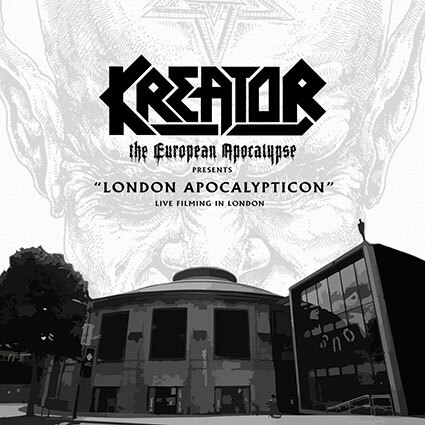 We are excited to announce ‘London Apocalypticon’ – filmed live from the Roundhouse, 16th December. Something very special in the works...more info COMING SOON! Be a part of Kreator history and let’s make this show CHAOS!